Monday I was fortunate to have the day off work and was joined by some amazing friends to bake all afternoon. 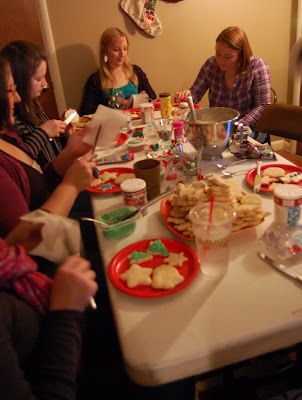 The goal was to have the cookies dunzo for the party so we could concentrate strictly on decorating them (and drinking wine). Finished cookies (wrapped and up high in the cabinet to keep away from little hands and doggie tongues): CHECK. 9 a.m. Drink coffee; lounge around w/ Nate in our pajamas watching Christmas movies. Take him to the park and to lunch in an attempt to exhaust him for a nap. 1 p.m. Realize nap is NOT happening, give it up and start to panic because the house is total chaos and 1o people are coming over that evening. Look with dismay at the four (that is a conservative estimate) piles of clean, unfolded laundry in my living room. 1:15 p.m. Call Karl in complete panic. 1:30 p.m. Start cleaning. When I try to sweep, Nate wants to sleep. When I try to vacuum, Nate wants to vacuum. 2:00 p.m. Deep breathing in paper bag. Secure a spray bottle of water and send Nate to the bathroom to "clean the bathtub." 4:00 p.m. Beg Karl to come home from work early b/c I need to run to Kroger and the liquor store. 4:30 p.m. Go to Kroger and become obsessed with the idea that MY HOUSE MUST SMELL LIKE CHRISTMAS. 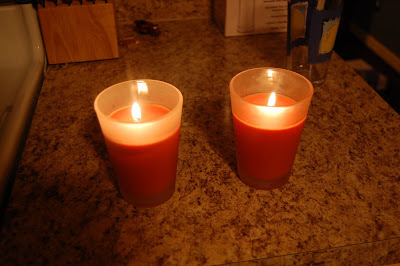 Look for christmas-scented candles. PANIC b/c I can not find any (for some reason the candles seemed like a REALLY important detail). Stomach starts hurting. Call mom on phone and she assures me that Cinnamon is most definitely a Christmas smell and that the scent of evergreen (and/or sugar cookies ala candle) makes her gag and break out in hives. Buy Cinnamon candles (among other things). 5:00 p.m. (Two hours until guests! ): Hit the liquor store for some wine. Get in line behind two ladies both WRITING CHECKS for enormous bottles of Woodbridge chardonnay. Head comes dangerously close to exploding at this point. 5:45 Put on a dress. Look in mirror. Hair is sopping wet; legs not, ahem, quite in dress condition. Curse aloud and with feeling. Decide jeans and flip flops are a better option. Sigh, throw wet hair in ponytail and call it good. 6:00 Light candles and start making dip. Realize dip has bacon in it and THAT HOUSE WILL NOT SMELL LIKE CHRISTMAS IT WILL SMELL LIKE BACON. Curse aloud and with (possibly excessive) feeling. Make bacon anyway (because bacon cheese dip is WORTH IT). Open all windows and turn on attic fan (because it was 70 degrees yesterday!). 6:30 Kristen arrives and (after a brief assessment) immediately opens the wine and pours me an enormous glass. 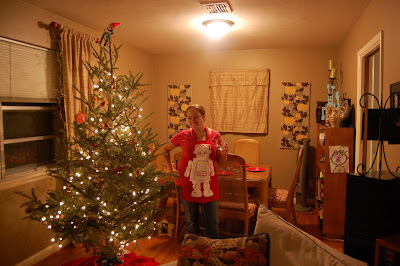 I can't get the tree lit (why was the plug wrapped around a branch I ask you!?!) so she does that and we decorate the tables together. 7:00 Guests arrive and I beg them to lie to me and tell me IT SMELLS LIKE CHRISTMAS, right? Right! Realize the guests are all people who are at my house once a week anyway and start to relax. 7:30 Drink copious amounts of wine, listen to Christmas carols, discuss the last time we all decorated cookies and make some CUTE cookies. Laugh and enjoy that I'm at a CHRISTMAS PARTY having a good time. 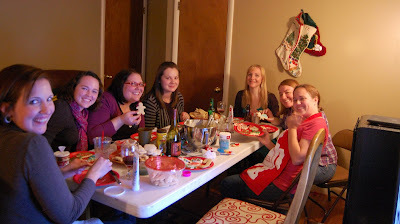 Feel thankful for friends (and cookies and attic fans and bacon dip). It was a fantastic party, Kat! Thank you so much for all your hard work. 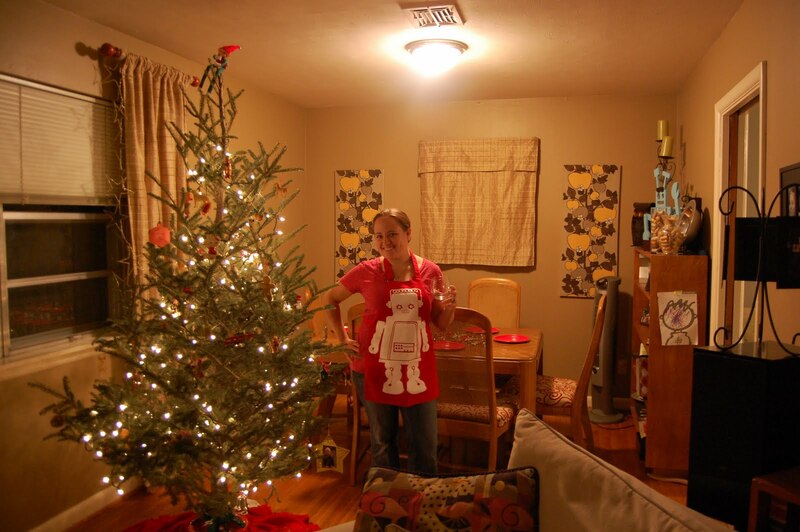 And, yes, the house smelled wonderful (and Christmas-y). Wow. This sounds A LOT like my life every time I attempt to host anything. It's exhausting but worth it. Wine helps. Bacon cheese dip?! I'm gonna need this recipe. Excellent sugar-cookie making/decorating, by the way. Bravo! xoxo. that part made my day. 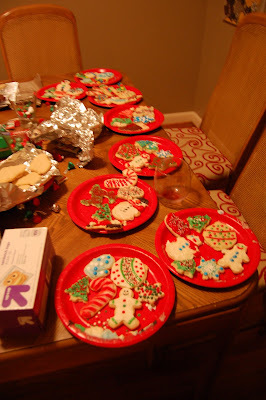 congrats on a successful cookie party! miss you guys! Are you sending me any cookies? or bacon cheese dip? good job kat! so sad I wasn't there. girl, you worry too much! and I for one, would be even happier with a house that smells like bacon than one that smells like cinnamon. okay - unrelated, but this post got me wondering about your no shampoo experiment. is it over? I just went totally hippie this morning and tried washing with baking soda and water per a book I read, but I am skeptical so far. @kate - i fell off the shampoo wagon for a little while but am firmly back on. it def 1. takes a few weeks for your hair and scalp (itchy) to adjust. and 2. is not for every hair type... seems like my friends with thinner/silkier hair had less luck. Mine is a thick, unruly mess and it works well for me! here was original post w/ link to "recipe" - http://www.karlandkat.com/2009/12/crunchy-yum-yums.html; I had to use more baking soda than recommended.